Vanda is an International Science Competition held annually around the globe. It is designed to focus on the student’s ability to think critically and creatively to pick out hidden information to aid them in solving the question. Vanda is catered to Year 3 to Year 10/11 (Primary 3 to Secondary 4/5) students. It follows closely with Singapore School Science Syllabus and tests on topics that are mostly similar to level of content that they have learned. This allows participants to do better compared to pure-Olympiad papers since they are familiar with some of the questions. 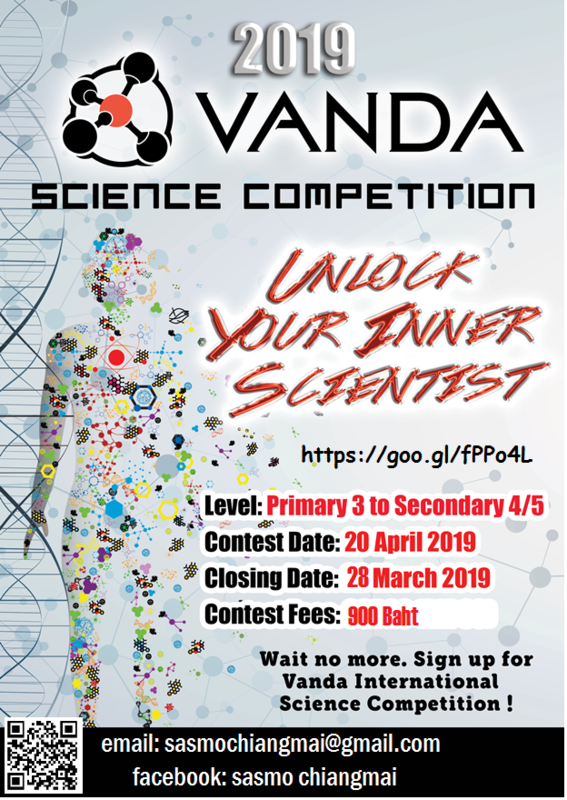 With realistic and high standards, Vanda contests aim to expose more students in Science Competitions and invoke their love for science. Furthermore, it will help them improve in school sciences as well as higher-order thinking skills (HOTS). Top scorers will receive Gold (8%), Silver (12%) and Bronze Awards (20%). All Gold, Silver and Bronze award winners in Vanda Science will be invited to join Joaquim International Science Competition to be held in Vietnam in November 2019. Each participant will get a Certificate. Vanda is an International Science Competition held annually around the globe.